Russia is blessed with the largest brown bear population in the world. Brown bear is one of the most widespread, well-known and popular animal in Russia. Due to strict enforcement of law bear population in Russia reached approximately 150,000. This number is higher than in the rest of the other countries combined. Bears are distributed throughout Russia unevenly. The European Northwest of Russia, Kamchatka peninsula, Sakhalin island and the coastal regions of the Pacific have the highest population density. Bear is an elusive and aggressive animal. Hunting bears is difficult and hunting methods vary greatly from region to region, depending on the habits of the local animals, food sources and terrain. After much debate and pressure from international hunting community winter den hunts, one of the oldest and most popular ways of hunting bears in Russia was banned in 2012. Now Russian bear hunting season is limited to spring and fall. Unlike in North America, where brown bears seem to prefer open landscapes, in Eurasia they inhabit mostly dense forests. One possible reason for this difference is that the particular population that invaded America thousands of years ago was from low land parts of Chukotka Peninsula of Russia. Five subspecies of brown bear are found throughout Russia. Sergei Shushunov and Russian Hunting LLC offers hunts for all five. These Giant bears are very similar to Kodiak bears of Alaska, but tend to be darker. Head and body length could be in excess of feet (305 cm), tail length 6-1/2 to 8-1/2 inches (16.5 to 21.6 cm), shoulder height 50-53 inches (127 to 135 cm). As with the Alaska brown bear, the Kamchatka brown bear grows large because of its abundant and protein-rich diet of spawning salmon and other fish in the coastal rivers, and because of comparatively mild climate that permits a shorter period of hibernation. It is a very large, dark bear with a massive skull. The forehead is broad and rather steeply elevated over the relatively short nose. The coat is long, dense and soft. The colour varies from pale yellow to blackish-brown and dull black, but dark individuals predominate. The legs are usually the same colour as the body. The claws are dark brown, some times with light yellowish streaks at the tips, and are up to four inches (100 mm) in length. The largest specimens are found in Kamchatka and on the Shantar islands. The record bear was obtained in Kamchatka and scored 30 9/16 inches. Hunting on Shantar islands is currently prohibited. Far eastern Siberia, including Kamchatka Peninsula, Sakhalin island, Karaginskiy Island, coastal strip west of the Sea of Okhotsk and east of the coastal mountains as far south as Uda bay, Shantar Islands and the northern Kuril Islands. 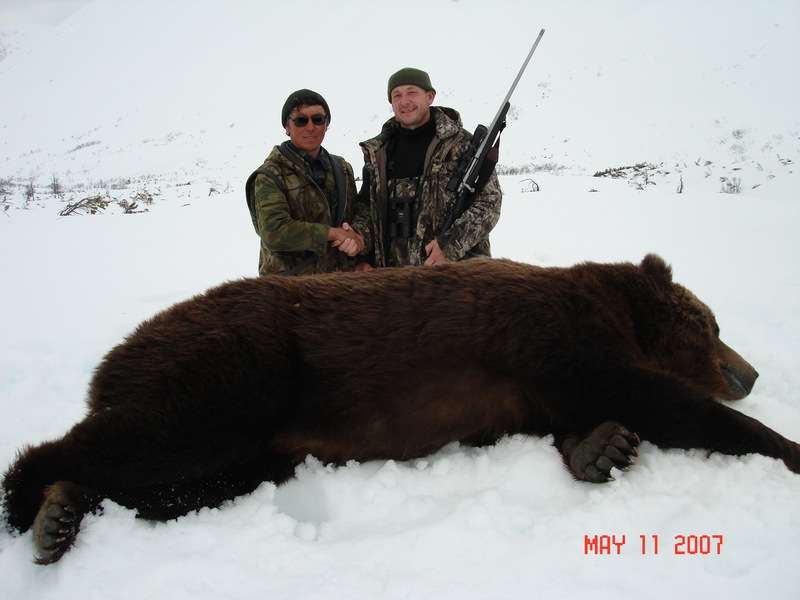 Hunting is organised in Kamchatka peninsula, Okhotsk, Magadan and Sakhalin island. During the Spring in the coastal areas bears are hunted along the shoreline, where they concentrate, looking for seafood. Inland bears are easily spotted on the hills, still covered with snow. A hunter can often spot 10 to 30 bears during the trip. In some places along the shoreline in the spring bears concentration is so high that tens of bears can be spotted in a single day. During the Fall hunting season bears are hunted while feeding on salmon in the many rivers and creeks, or on wild berries in the surrounding tundra. The usual size of the bears taken is around 8.0-9.0 ft square in Magadan and Okhotsk and 9.0-9.5 ft. square in Kamchatka. The success rate is essentially 100%. Many hunters choose to take 2 bears. Larger caliber magnum cartridges in 325-375 range are recommended. 300 Winchester Magnum , should be the minimum. It is smaller and darker than the Kamchatka brown bear, with a differently shaped skull and much larger teeth. The coat is often almost black in colour. The skull is longer and narrower, with especially long nasal bones and it is flatter in profile, being less elevated over the nose. The ears are noticeably hairy. Consists of the following races listed by various authorities: lasiotus (northern China), cavifrons (northwestern Manchuria), mandchuricus (Primorsky Krai), jessoensis (Sakhalin), yesoensis (Hokkaido), and melanarctos (Hokkaido). The record bear, obtained in Khabarovsk region scored 27.6 inches. Russia: Southern Kuril Islands, Sakhalin, Maritime Territory, and the Ussuri/Amur river region south of the Stanovoy Range. China: Northeastern Heilongjiang. Japan: Hokkaido. Hunting is organised on Sakhalin island, in the Khabarovsk and Primorsky regions in the Spring by stalking along the sea shore line and in the Fall by stalking with aid of the digs. 300 Win Mag. Or similar cartridge is the minimum. Izubr stag and moose cane be taken as an additional trophy during the fall season. Head and body length is up to 8 feet (2.4 m) and more. Tail length is up to 6 inches (15.2 cm). Shoulder height 35-43 inches (89-109 cm). Weight 220-660 pounds (100-300 kg) and more. Females are about two-thirds of the size of males. This is a good-sized, powerfully built bear with a distinct shoulder hump, a large head supported by a short, muscular neck, and a concave facial profile. Overall colour can vary with individual bears from light grayish-yellow to very dark brown, almost black. Juveniles may have a conspicuous pale collar. The coat length depends on region and season. This bear is solitary except when mating, and very territorial, with a large home range. They breed late May to July, with cubs born in the den from late December to February. Cubs remain with the mother two years or longer. Sexual maturity is reached at five years or later. These bears are active mainly at twilight and at night. Largely herbivorous, eating all kinds of plants. They also eat ants, insect larvae, honey, rodents, fish and carrion. Occasionally they may kill larger animals such as moose, reindeer and domestic livestock. Hibernation lasts up to 6 months. Senses of smell and hearing are excellent, eyesight not as good. This bear is a fast and agile runner and an excellent swimmer. Adults are unable to climb trees because of the shape of their claws and their body weight. The records from Europe and Asia are registered separately. 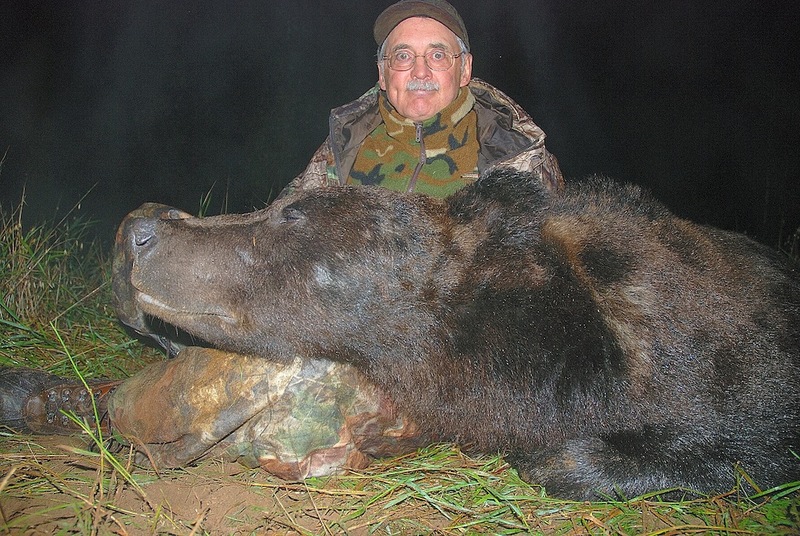 The record bear scored 27 6/16” taken in the Pskov region or Russia. The most widespread form of brown bear in Eurasia is mainly found today in Russia, Romania and the former Yugoslavia. Smaller numbers are found in Norway, Sweden, Finland, the Czech Republic, Slovakia, Poland, Hungary, Albania, Bulgaria and Greece, and remnant populations are found in Spain, France and Italy. The current estimated population of Eurasian brown bear in Russia is well over 30,000. Inhabits coniferous forests with an abundance of edible plants, frequently with steep terrain and difficult access. This is the most popular and least expensive brown bear hunt not only in Russia, but anywhere in the world. We organise hunting for the European population of Eurasian bear in the North-Western part of Russia and for the Asian population in the Ural mountains and in the Eastern Siberia. These are some of the best hunts in the European part of Russia. The bear population during the past 20 years has been very stable. The usual trophy size is about 7.5-8 ft. square, although 8.5- ft. bears have been taken by our clients every year. This bear is usually hunted by baiting during the spring or fall, by chance encounter while hunting other game during the fall. Sometimes hunted by breaking into their dens during hibernation, which is a very dangerous and adrenalin loaded hunt. The success rate is about 90%. Some hunters take more than one bear. We recommend to use at least 30-06 or similar cartridge. The Siberian brown bear is intermediate in size between the Eurasian and Kamchatka brown bears. It is larger than the Eurasian brown bear, with more massive bones and a somewhat larger and heavier skull, but smaller than the Kamchatka brown bear The fur is long, soft and dense, it is more luxuriant than that of any other bear. The colour is usually dark brown with noticeably darker legs, but will vary from light pale brown to dark brown, and some individuals will show yellowish, cinnamon or black tones. The claws are brown to blackish-brown, strongly curved, up to 3- 1/3 inches (85 mm) in length. The brown bears of the Kolyma and Anadyr basins are included in this category. They are similar to the grizzlies of North America – smaller, long-haired and aggressive. The Siberian brown bear category includes the following subspecies that have been described by various authorities: collaris (Siberia), sibiricus (Siberia), jeniseensis (Krasnoyarsk region), kolymensis (Kolyma River), and baikalensis (lrkutsk region). The record trophy score is 26 13/16 inches. The second largest SCI trophy was taken by one of our clients. East of the Yenisey river in most of Siberia (except for the habitat of the Kamchatka and Amur brown bears.) Also in northern Mongolia, far northern Xinjiang, and extreme eastern Kazakhstan. We organise Siberian bear hunt in the Krasnoyarsk, Irkutsk, Altai and Yakutia regions. These hunts usually take place in rugged and heavily forested terrain, where getting in range of the bear offers a greater challenge. The best chance to spot a bear is in the foothills of the mountains, or along the shorelines, where the forest is less dense. Spring hunts, when bears actively look for food and there is no foliage to conceal them are usually 100% successful. Horses and boats are used very often for transportation. Another option, baiting, is frequently used when hunting takes place in the dense forest. 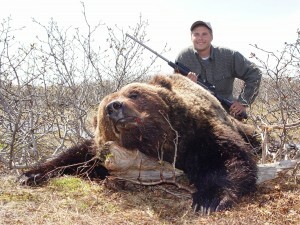 The average trophy is similar in size to a North American grizzly. 300 caliber magnum cartridge should be the minimum. This is a smaller brown bear, considerably paler in colour than the Eurasian brown, with a coarser and sparser coat. The colour varies from pale straw to dull grayish-brown, with a large dark brown patch of long hair on the withers and sometimes a rather wide dorsal stripe extending back from it. There may be a dark brown patch on the head and sometimes there is a white collar. The claws are straighter and lighter in colour than in northern races. Smaller, lighter coloured bears tend to occur at higher altitudes, with larger and darker bears in the forests below. This bear is extremely aggressive towards humans. The record was obtained in Turkey and scored 26 inches. Turkey, Syria, Iran, and the Caucasus mountains of Russia, Georgia and Azerbaijan. Russian Hunting Agency and Sergei Shushunov offer Mid Eastern Brown Bear hunts in the Northern Caucasus by stalking. The hunt is physically demanding due to a very difficult and steep terrain and unpredictable weather. 30-06 or similar cartridge is the minimum.